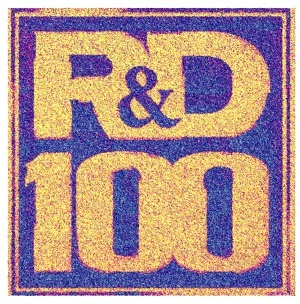 Often referred to as the "Oscars of Invention," Oak Ridge National Laboratory (ORNL) and Asylum Research have just received the prestigious 2008 R+D 100 award for the development of Band Excitation (BE), a new breakthrough scanning probe microscopy (SPM) technology. Band excitation allows more rapid probing of energy dissipation at the nanoscale than previously possible, enabling scientists to characterize a sample's electrical, magnetic, and mechanical energy conversion and dissipation properties at standard imaging rates. 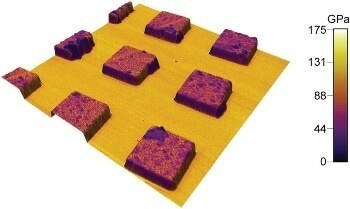 Bit-mapped voltage lithography on a sol-gel PZT thin film taken with the Asylum Research MFP-3D using the Piezo Force Module. 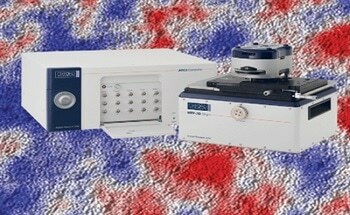 PFM amplitude is painted on top of the rendered AFM topography, 50µm scan. "This award acknowledges the important step forward that this technique represents and signals where the field of microscopy can and will go in the near future," noted Dr. Stephen Jesse, another co-inventor from the CNMS. "The speed and flexibility of the latest generation of Asylum SPM controllers permit the fine tuning and fast acquisition of data streams needed to take us from mere imaging to an arena of information-rich insight into cantilever-surface interactions and material functionality." BE technology has been licensed to Asylum Research from Oak Ridge National Laboratory. Using a BE controller and software, BE extends the capabilities of the MFP-3D™ Atomic Force Microscope (AFM) to map local energy dissipation through the determination of the Q-factor and the full transfer function of the cantilever-sample system. The applicability of SPM for mapping energy transformations and dissipation has previously been limited by the fundamental operation mechanism employed in nearly all conventional SPMs based on excitation and detection by a cantilever to the sample at one or two excitation frequencies. At the same time, energy dissipation detection requires measuring the width of the resonant peak of the cantilever, or Q-factor. The continuous sweep of excitation frequencies results in extremely large data acquisition times which are incompatible with imaging. BE overcomes this limitation by exciting and detecting the response at all frequencies simultaneously. In BE, a conventional sine wave is substituted by a synthesized digital signal that spans a continuous band of frequencies and monitors the response within the same frequency band. This allows ~100x improvement in data acquisition speed compared to currently available commercial technologies without decreasing the signal to noise ratio. A full response spectrum can then be collected in the amount of time required for obtaining a single pixel in standard SPM. BE will be an important technology in understanding energy dissipation in a diverse range of technologies such as electronics, information technology, and energy storage and transport, and more. Band Excitation is currently available for use with the Asylum Research Piezo Force Module for the MFP-3D AFM that allows high voltage, cross-talk free piezoresponse force microscopy (PFM), and is planned to be incorporated as an integral part of next-generation Asylum Research controllers for topographic, magnetic, electrical, and other SPM imaging modalities.